Combining the power of a large optical tube and the extreme portability of the patented collapsible FlexTube design, the new Skyliner FlexTube Dobsonians offer an incredible aperture-to-price ratio. The patented dual-encoder design allows you to manually move the telescope anytime and to anywhere you wish - with no need for realignment. Suitable for high-power Lunar and Planetary observations, double-star observations etc, the Skyliner 250P is a 10-inch (250mm) reflecting telescope that is powerful enough to reveal many secrets of the night sky. It offers sharp and bright images, enabling you to view objects during the day, and dazzling sky-objects during the night. 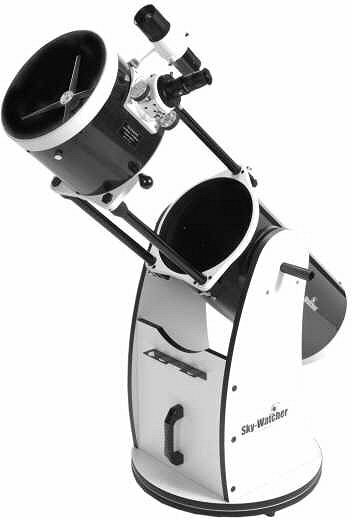 Our Skyliner 250P Reflector Telescope is manufactured by Sky-Watcher, one of the most respected telescope manufacturers - products you can trust, representing great value for money. "Despite their great performance to cost ratio, Dobsonians can be rather bulky in larger apertures, but Sky-Watcher have addressed this with their innovative and aesthetically-pleasing Flextube range. With their collapsible tube design, these versatile instruments are easy to store and can be readied for observation at a moments notice. Ideal for deep-sky viewing, these `scopes will also deliver stunning planetary images." "The upper section of the FlexTube containing the secondary mirror assembly and Crayford focuser extends with effortless precision on three rods that are easily locked into position at their greatest extent. Despite repeatedly collapsing and extending the instrument in the course of an prolonged observing session, the FlexTube`s optics remained in perfect alignment." The exciting new Sky-Watcher Dobsonian series are precision engineered instruments that will allow you to easily find and enjoy viewing night sky treasures, such as Planets, Nebulae, Star Clusters, Galaxies and much more. With its patented collapsible tube design, these Dobsonians are truly the ultimate in portability and performance. The elegant truss tube design was carefully engineered to combine ease of use, extreme portability and consistent performance in an affordable package. Unlike other truss tube designs, the SkyWatcher Collapsible Dobsonian does not need to be disassembled between uses. It transports as two compact pieces that can be assembled and ready to use in just seconds! It is easy to collimate once set up, and it holds its collimation throughout the evening! The patented Tension Control Handle allows users to add or reduce tension, thereby increasing or decreasing the friction between the optical tube and the sideboards.